Ukraine – Around 300 people held a protest against the OSCE in eastern Ukraine on Thursday, picketing a hotel in rebel-held Donetsk in what the security watchdog said was an orchestrated move to restrict its work. The protesters, mainly women, arrived at the hotel in two buses accompanied by the city’s separatist mayor Igor Martynov. 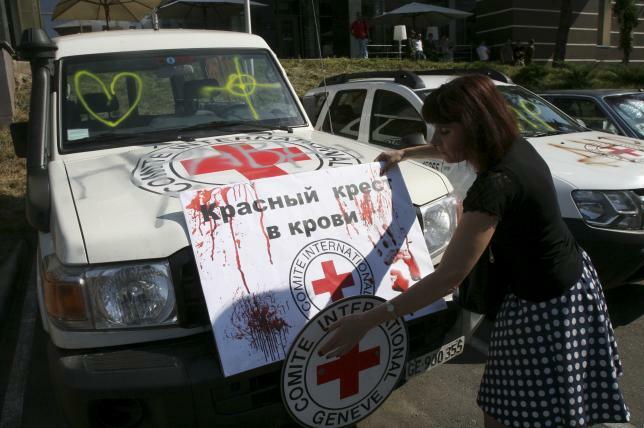 A Reuters witness said they spray-painted peace slogans on the cars belonging to the OSCE (Organisation for Security and Cooperation in Europe) a Reuters witness said. The OSCE said the crowd was protesting the deaths of civilians in shelling despite a ceasefire deal and also against the work of the OSCE, which is monitoring the implementation of a peace agreement between Ukraine and pro-Russian rebels. He accused both sides of failing to respect the ceasefire by not fully withdrawing their heavy artillery as required by the peace agreement, which was brokered in February to end a conflict in which over 6,500 have been killed. Three Ukrainian servicemen have been killed and over 40 wounded as a result of rebel attacks in the past week, according to Ukraine’s military.